Boston: Houghton Mifflin Company, 1942. First edition, first state with the date of 1942 to the title page of Beryl Markham’s classic autobiography. Octavo, original green cloth. 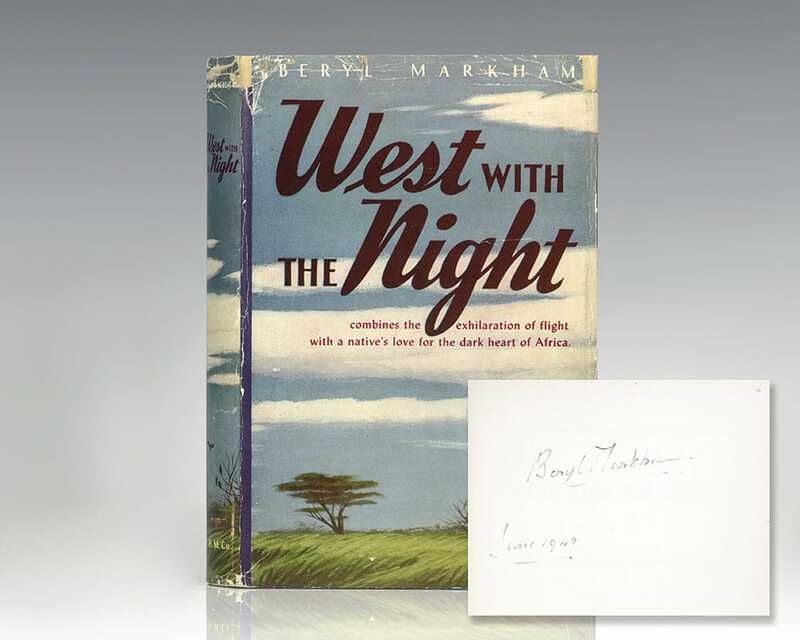 Signed by the author on the front free endpaper in the year of publication, “Beryl Markham June 1942.” From the library of journalist and publicist Arthur Ronnie with his bookplate below the inscription. Arthur Ronnie acquired an impressive collection of autographs throughout his nearly 70-year career as a publicist in Hollywood, most of which he acquired in personal interviews. His collection focused on American presidents, Hollywood entertainers, explorers and aviators. Near fine in a near fine dust price-clipped dust jacket jacket with some light wear and reinforcement to the verso. Scarce and desirable. Books signed by Markham are uncommon, particularly in this condition. In 1939, three years after she became the first aviator to fly solo across the Atlantic Ocean from London to North America, Beryl Markham moved to the United States where she began writing her autobiography. 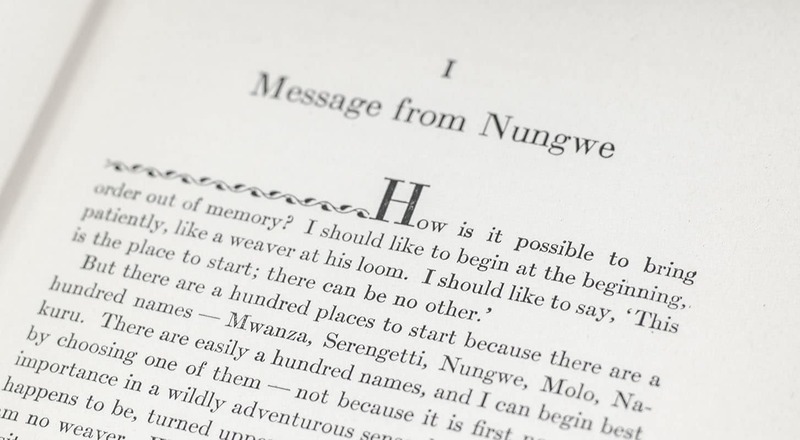 Published in 1942, the book was favorably received, and revealed in detail the story of her childhood in British East Africa, her career as a horse trainer and bush pilot, and her pioneering transatlantic flight. 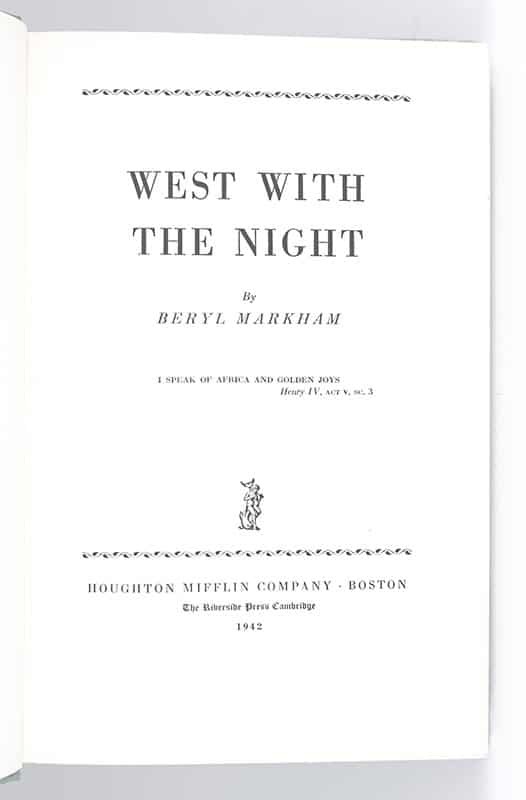 Ernest Hemingway wrote in a letter to editor Maxwell Perkins: "Did you read Beryl Markhams book, West with the Night? I knew her fairly well in Africa and never would have suspected that she could and would put pen to paper except to write in her flyers log book. As it is, she has written so well, and marvelously well, that I was completely ashamed of myself as a writer. I felt that I was simply a carpenter with words, picking up whatever was furnished on the job and some times making an okay pig pen. But [she] can write rings around all of us who consider ourselves as writers. The only parts of it that I know about personally, on account of having been there at the time and heard the other peoples stories, are absolutely true I wish you would get it and read it because it is really a bloody wonderful book." In 2004, National Geographic Adventure ranked West With The Night number 8 in a list of 100 best adventure books.